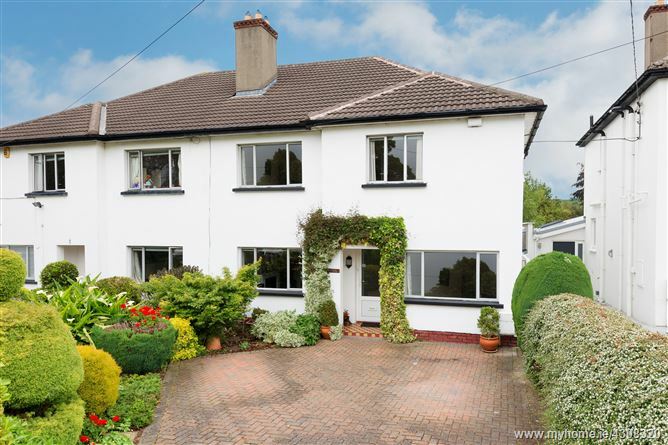 In the heart of Mount Merrion is this attractive 1950’s home having been well cared for by the same family for the past 45 years. Offering spacious accommodation of c. 165sqm this fine residence is ideally located on one of Mount Merrion’s most sought after roads and has so much to offer the discerning purchaser particularly a young family. North Avenue is a quiet road with many attractive homes and offers easy access to the bus routes on the N11, Fosters Avenue with UCD or the numerous schools outlined below. RTE & St. Vincent's Hospital are within walking distance. Offering excellent potential to extend into the rear garden (subject to planning permission if above exemption status) this fine property also offers magnificent, landscaped gardens to the front and rear. The accommodation comprises an inviting entrance hall, interconnected living / dining room with access to the bright conservatory, kitchen enjoying a pleasant outlook over the garden, generous breakfast room and further study/TV room. On the first floor are four excellent bedrooms three of which are generous doubles. There is also a family bathroom and separate toilet. Again the rear garden is beautifully landscaped with an attractive patio area extensive lawns, colourful plants and shrubs and a gated side entrance leading from the landscaped front garden with its cobblelocked forecourt providing ample off street parking and mature shrubbery. There are a host of amenities on the doorstep including Dublin's premier schools and Universities all located within walking distance, such as Blackrock College, St. Andrew's College, Mount Anville, Oatlands College, and UCD. The house is in the catchment area for Scoil san Treasa. Which is a highly regarded national school and is adjacent to Deerpark which is a substantial park with playground, tennis club and other amenities. There are also numerous shopping centres within striking distance including Stillorgan, Blackrock and Dundrum Town Centre. The N11, with the QBC, is within easy walking distance and the M50 is easily accessed allowing for easy travel in and out of the city centre. With ceiling coving, ceiling rose, dado rail, under stairs storage, alarm panel and phone point. Stairs to first floor level. With ceiling coving, ceiling rose and open fireplace with marble surround and granite base. Sliding door to conservatory. Very bright space with tiled floor and built in shelving. Door to patio and rear garden. With tiled floor, fitted base and wall level units, tiled splash back, integrated oven and hob, provision for fridge/freezer, plumbing for washing machine and stainless steel sink with drainer. Spacious front facing reception room. Bright space giving access to the bedrooms. Spacious double bedroom with built in wardrobes, wash hand basin and TV point overlooking the rear garden. Front facing double bedroom with built in wardrobes. Front facing double bedroom with wash hand basin and wall mounted mirror. Single bedroom with wall mounted mirror. With tiled floor, partly tiled walls, wall mounted mirror, attic hatch, shelved hot press, corner shower enclosure, bath, wash hand basin and separate w.c.